The Zultys ZIP 59i is for the discerning executive who wants the very best in the industry. Featuring a high quality 5.7” full color high resolution VGA touch screen display, this stylish SIP Open Standards-based phone offers an intuitive graphical user interface, 55 touch screen softkeys, full duplex wideband audio speaker and handset (for the best audio anywhere), dual Gigabit Ethernet Interfaces and extensive call management capabilities, built-in bluetooth interface and a USB port. 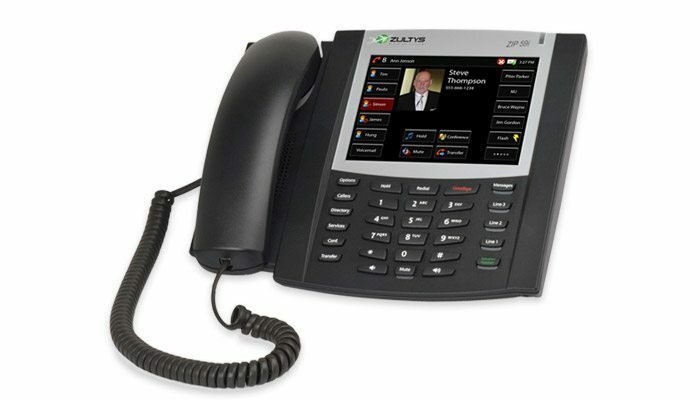 The ZIP 59i is fully interoperable with the Zultys MX family of award-winning IP Telephony platforms and MXIE Unified Communications desktop client. The high resolution (640 x 480) full VGA backlit LCD Touch Screen display is at the heart of the ZIP 59i. A state of the art display, the screen provides helpful navigational menus to take full advantage of the powerful telephony features this SIP phone brings to the desktop. Adjustable brightness settings can be used to ensure maximum resolution quality in any lighting environment. All ZIP-5 Series IP Telephones offer full-duplex speakerphone for excellent voice clarity and delivery. With over eight years experience in IP telephony and IP telephone design, Zultys can ensure superior voice quality on every product we sell. From initial deployment and configuration to future enhancements and upgrades, the Zultys family of IP telephones are designed to save your business time and money. Dual auto-sensing Gigabit (10/100/1000 Mbps) Ethernet ports eliminate additional wiring and simplify installations. Integrated IEEE 802.3af Power-over-Ethernet allows easy deployment with centralized powering and backup. All ZIP 5-series IP phones are easily provisioned and updated via Zultys’ market-leading MX administrator graphical management application.